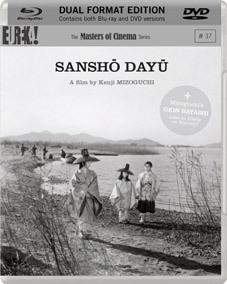 Masters of Cinema are continuing their upgrade of previous releases with new dual format editions of Mizoguchi masterpieces Ugetsu Monogatari and Sanshô Dayû. This will be the first time either film has had a blu-ray release anywhere in the world. Mizoguchi's Ugetsu Monogatari (Tales of the Rain and Moon, aka Ugetsu) is a highly acclaimed masterwork of Japanese cinema. Based on a pair of 18th century ghost stories by Ueda Akinari, the film's release continued Mizoguchi's introduction to the West, where it was nominated for an Oscar and won the Venice Film Festival's Silver Lion award (for Best Direction). In 16th century Japan, amidst the pandemonium of civil war, potter Genjûrô (Mori Masayuki) and samurai-aspirant Tobei (Ozawa Sakae) set out with their wives in search of wealth and military glory respectively. Two parallel tales ensue when the men are lured from their wives: Genjûrô by the ghostly charm of Lady Wakasa (Kyo Machiko); Tobei by the dream of military glory. 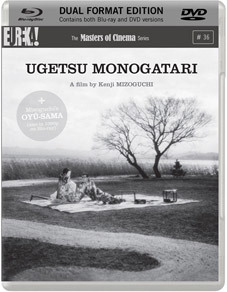 Famed for its meticulously orchestrated long takes and its subtle blending of realistic period reconstruction and lyrical supernaturalism, Ugetsu Monogatari is an intensely poetic tragedy that consistently features on polls of the best films ever made. Eureka's Masters of Cinema Series will release Mizoguchi's classic alongside the lesser known Oyû-sama (Miss Oyû, aka Lady Oyû) in a special UK Dual Format edition, on Blu-ray for the first time anywhere in the world, on 23 April 2012 at the RRp of £23.48. Illustrated booklet featuring rare archival imagery and award-winning translations of the 18th century Ueda Akinari stories adapted in Ugetsu Monogatari. Based on an ancient legend, as recounted by celebrated author Mori Ôgai (in his short story of the same name, written in 1915), and adapted by Mizoguchi, Sanshô Dayû (Sanshô the Steward, aka Sanshô the Bailiff) is both distinctively Japanese and as deeply affecting as a Greek tragedy. Described in its opening title as "one of the oldest and most tragic in Japan's history", Mizoguchi depicts an unforgettably sad story of social injustice, family love, and personal sacrifice – all conveyed with exquisite tone and purity of emotion. Set in Heian era (11th century) Japan, it follows an aristocratic woman, Tamaki (played by Tanaka Kinuyo, who also stars in Mizoguchi's Ugetsu Monogatari), and her two children, Zushiô (Hanayagi Yoshiaki) and Anju (Kagawa Kyôko), who are separated by feudal tyranny from Tamaki's husband. When the children are kidnapped and sold into slavery to the eponymous "Sansho" (Shindô Eitarô), the lives of each of the family members follow very different paths – each course uniquely, and insufferably, tragic. Famed for its period reconstructions and powerful imagery, often through the director's trademark long takes, Sanshô Dayû is one of the most critically revered of all of Japanese cinema – a Venice Film Festival Silver Lion winner that often appears in lists of the greatest films ever made. Eureka's Masters of Cinema Series will release Mizoguchi's classic alongside the lesser known Gion Bayashi (Gion Festival Music, aka A Geisha) in a special UK Dual Format edition, on Blu-ray for the first time anywhere in the world, on 23 April 2012. Illustrated booklet featuring rare archival imagery and a full reprint of the 1915 Mori Ōgai story adapted in Sanshô Dayû.